Following the box-office success of Little Caesar and The Public Enemy, two gangster-themed films released in 1931, there was concern among state censors that the American public might begin to view criminals in a sympathetic light, or, worse still, as role models. As a result, they came down hard on Scarface, a 1932 crime movie produced by millionaire Howard Hughes, and demanded (among other things) that the additional title The Shame of a Nation be added to the film. 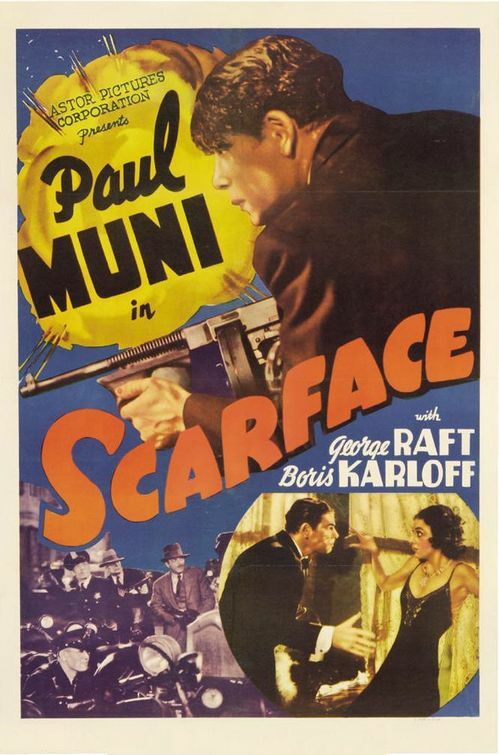 Yet, despite their best efforts, the combined talents of star Paul Muni and director Howard Hawks transformed Scarface into the era’s most violent, and most effective, gangster film. Based loosely on the life of Al Capone, Scarface stars Paul Muni as Tony Camonte, a hard-nosed criminal who, as the movie opens, is the right-hand man of mobster Johnny Lovo (Osgood Perkins). But it isn’t long before Tony makes a play for the top spot, cozying up to Lovo’s girl, Poppy (Karen Morley), and knocking off rivals like Gaffney (Boris Karloff). With the help of his close pal, Guino Rinaldo (George Raft), Tony is soon the king of New York’s criminal underworld, but with the police constantly breathing down his neck, he finds it isn’t nearly as much fun as he thought it would be. As played by Muni, Tony is a ferocious, contemptible thug, a blunt instrument who lets his guns do the talking. Even in his personal life, Tony is reckless; the relationship he has with his kid sister, Cesca (Ann Dvorak), is borderline incestuous, and their scenes together have a sexual energy that’s downright disturbing. Yet, in spite of all this, Muni somehow makes Tony an appealing character, a guy who gets such a kick out of being a gangster that his enthusiasm spills off the screen (you can’t help but smile at the scene where he first gets his hands on a Tommy Gun, acting as excited as a kid on Christmas morning). As far as the violence is concerned, director Howard Hawks rarely shows any on-screen killings, yet presents each murder in a manner that's just as poignant. When Boris Karloff’s character, Gaffney, is gunned down in a bowling alley, we hear the shots that finish him off, but what we see is a bowling ball rolling down the lane, and a single pin toppling over, as if to signify the deed’s been done. Much to the censors’ chagrin, Scarface not only matched the success of Little Caesar and The Public Enemy, it surpassed them, proving once and for all that cinematic gangsters were here to stay. Jeff: Jay is a very close friend of mine, and I respect his opinion immensely, but there are definitely times we don't see eye-to-eye! I'm with you on this one... SCARFACE is an 8.5 or above!